 See all the latest IT solutions from 150+ leading vendors including AT&T, Cisco, Dell, HP and Microsoft.  Attend 40+ free sessions covering the full range of IT issues.  Hear keynotes from top minds at Cisco, Citrix, Dell, Emulex, Rackspace, RedHat, Terremark and Xirrus.  Tour the event network, built by volunteers with hand selected vendors. Attend classes led by InteropNet engineers. Booth Crawl: Enjoy vendor-hosted beverages while you check out the latest products and services in the Expo. Cloud Zone: Meet innovative cloud computing vendors in a special area in the expo. Attend free classes in the Cloud Zone Theater. T-shirt: Collect poker chips by visiting participating vendors and redeem for a free Interop t-shirt. Become an IT Hero: Interop gives you the most important technologies and essential strategies to drive business value from your IT organization. Register today. Need help justifying your trip? Use this letter to make your case or create a custom event schedule and email it to your boss. Welcome to this edition of the PPC Insiders Search Engine Marketing Newsletter. »Is Google Quietly Trying to Compete with PPC Software Companies? »Google Instant Search: What's the Impact on PPC? The goal of the new Twitter interface is to provide a richer user experience and a more robust platform to search, share, access, and explore content and information. All 160 million registered users will soon be privy to the new features which include embedded media capabilities and easier content sharing and accessibility. Is Google Quietly Trying to Compete with PPC Software Companies? Over the years, Google has been consistently adding more "bells & whistles" to their AdWords Platform, and they are continuing to show signs of becoming their own PPC Management Software Company that could be a real threat to the existing leading companies in the marketplace today. Google Instant Search: What's the Impact on PPC? Last week Google launched "Instant Search." Instant search essentially fills in words and phrases for you as you conduct a search on Google. For example, let's say you start to type in "goo". Before you get further, you'll see a list of potential queries, like "Google" and "Goo Goo Dolls" and so on. We recently had the opportunity to talk with David Szetela about his new book Pay-Per-Click Search Engine Marketing An Hour a Day and learned some exclusive insights into how Search Marketers can better leverage Pay Per Click (PPC) Marketing channels and tools. From the search engines to social media, David's new book offers some invaluable tips that every Search Marketer should know. » Is Google Quietly Trying to Compete with PPC Software Companies? » Google Instant Search: What's the Impact on PPC? --15 Expert-Led Live Web Seminar Sessions. Look out Apple, there's a new tablet in town. 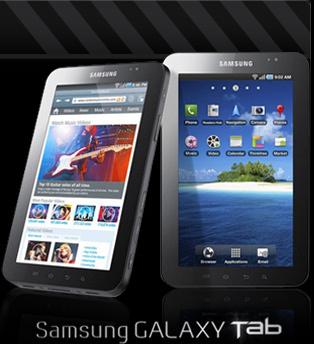 The tech world is abuzz over the new Samsung Galaxy Tab. If you haven't seen it, it's a gorgeous Android running, video conferencing, eReading, web browsing 7-inch screen tablet powerhouse - that plays DivX HD video.